You’re Undead to Me Clips! Elena scenes from 1.05 You’re Undead to Me of The Vampire Diaries have been added to Neenz The Vision so head on over and check them out! Preview Below! Elena figures out Stefan’s Secret! Thanks to my amazing friend Tathy at Night&Day Design I have a stunning layout for Neenz The Vision, your best source to Stream Nina Related Videos, it is a work in progress but check it out and enjoy! 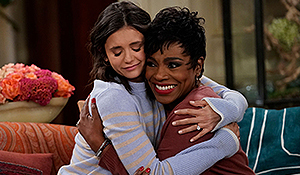 Finally Nina is going to be on a Late Night Show makes me so happy , be sure to set your DVR’s for May 5th Nina will be on Jimmy Fallon, I will have captures and a video up after it airs. Thanks to Vampire-Diaries.net for the information. Clips from The Vampire Diaries Episode 1.04 Family Ties have been added to Neenz The Vision so head on over and check them out. Clips from 1.03 Friday Night Bites of The Vampire Diaries have been added to Neenz The Vision so head on over and check them out. Clips from 1.02 Night of the Comet of The Vampire Diaries have been added to Neenz The Vision so head on over and check them out.